Brooklyn’s Ebbets Field had been scheduled as the site of the 1942 All-Star Game. But because of America's entry into World War II the previous December, Major League Baseball moved the game across the East River to take advantage of the Polo Grounds’ larger seating capacity. Brooklyn would not host the game until 1949, the last of the major-league locations in existence in 1933, the year of the first game, to do so. Baseball had made the change to raise as much money as possible for the two beneficiaries of the contest, The Bat and Ball Fund, which supplied baseball equipment to servicemen, and the Army-Navy Relief Fund. In addition, they had doubled the price of tickets, which in previous years had been the same as they were for regular-season games. Box seats were $4.40, reserved seats $3.30, unreserved grandstand $2.20, and bleachers $1.10. And in a move to allow working people to attend, the starting time had been moved back to 6:30 P.M. Unfortunately, rain fell in New York, not enough to postpone the game, but enough to limit attendance to just 33,694. Coincidentally, that was just about the capacity of Ebbets Field and considerably below the 50,000-plus expected, or even the 48,000 who attended the 1934 game at the Polo Grounds. Nevertheless, because of the higher ticket prices, the two charities were able to split $95,000. Only a few major leaguers were in the military in 1942, but they included some of the game’s brightest stars, men such as Hank Greenberg, Bob Feller, Cecil Travis, and Buddy Lewis, all American Leaguers. Conversely, 16 players were making their first All-Star appearances, including Giants outfielder Willard Marshall and Red Sox pitcher Tex Hughson, neither of whom had yet played a full season in the big leagues. Last year’s pennant winners, the Yankees and the Dodgers, who were again leading their respective leagues, had the most representatives. The Yankees had nine, while the Dodgers had seven. Four Yankees and three Dodgers were in the starting lineups. Managers Joe McCarthy of the Yankees and Leo Durocher of the Dodgers used their 25-man rosters in diametrically opposed fashions. McCarthy set a still existing (as of 2014) All-Star record by using just 11 players, while Durocher used 22. The entire AL starting lineup played all nine innings, but the only National Leaguer to play all nine was hometown favorite Mel Ott of the Giants. A thunderstorm delayed the start of the game for more than 50 minutes. By the time National League starter Mort Cooper took the sign from catcher Walker Cooper, his brother and Cardinals teammate, it was 7:23 P.M. and the lights were on for the first time in an All-Star Game. 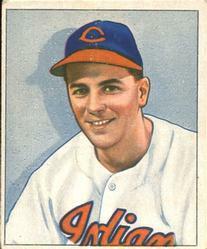 The leadoff batter was shortstop Lou Boudreau, not yet 25 but in his first season as player-manager of the Cleveland Indians. Boudreau took the first pitch for a ball, before driving the next offering into the left-field upper deck. Boudreau’s home run was the first in All-Star competition by a Cleveland player. Tommy Henrich, making his All-Star debut, followed with a double. Cooper was able to retire the game’s two most dangerous hitters, Ted Williams and Joe DiMaggio, but Detroit’s Rudy York hit a high fly that reached the lower deck in right field, just inside the foul line. It was the kind of hit that would have been a home run in only one major-league park, the Polo Grounds. York’s two-run homer gave the American League all the runs they would need in their 3-1 victory. Following their first-inning power display, the Americans managed just four singles the rest of the way. The win was the AL’s third in the last four years and upped their overall lead to seven games to three. The National League’s only run came on an eighth-inning pinch-hit home run by Brooklyn’s Mickey Owen. Interestingly, Owen would play in 133 games for Brooklyn in 1942, but this would be his only home run. As with Boudreau, the home runs by York and Owen were the first hit by members of their respective teams. New York’s Spud Chandler was the starting pitcher for the AL, the eighth start by a Yankees pitcher in the first ten All-Star Games. Chandler pitched four scoreless innings, allowing just two hits. The two leagues had agreed to let pitchers work more than the usual three-inning limit because the winner of the game would go to Cleveland the next day to play a servicemen’s All-Star team. Lifting the three-inning limit would allow each manager to hold back some pitchers for the next day. They agreed that a pitcher could go as long as five innings today, and that is what Detroit’s Al Benton, who relieved Chandler, did. Over those last five innings, Benton walked two and gave up four hits, but the only run he allowed was Owen’s home run. Durocher used four pitchers: Cooper and Cincinnati’s Johnny Vander Meer each pitched three innings, Chicago’s Claude Passeau worked two, and Cincinnati’s Bucky Walters threw one. Pitching selections had been made more difficult for the two managers because the game was on a Monday, one day after the usual Sunday doubleheaders and two days after the traditional Fourth of July doubleheaders. Regarding the rosters, each manager had the task of selecting his entire 25-man team. They were required to include at least one player from each team on the final squad. The late start, caused by the rain, had imposed an additional problem. The military authorities had decided that the lights would have to be turned out by 9:10 P.M. Then, shortly before the first pitch, they agreed to allow play to continue until 9:30, the time for Mayor Fiorello LaGuardia’s regularly scheduled total blackout of the city. It turned out not to be a problem when the quick pace of the game allowed it to end two minutes before the 9:30 deadline. Despite the darkness, the crowd made their way to their cars, buses, and subways without incident, pleasing everybody involved, as this was the first major sports event to take place during a blackout. The following night the victorious American Leaguers traveled to Cleveland to take on Lieutenant Mickey Cochrane’s Service All-Stars. More than 62,000 showed up to see the AL knock out Feller in the second inning on their way to a 5-0 victory. Jim Bagby of the Indians, Sid Hudson of the Senators, and Tex Hughson combined for the shutout. This article originally appeared in "Who's on First: Replacement Players in World War II" (SABR, 2015), edited by Marc Z. Aaron and Bill Nowlin.